Note: CadOasis primarily focused on CAD Software not PLM or DATA Management Software. However based on our Users interest we are Showing brief information about ‘SolidWorks EPDM add-in’ for DraftSight. If many people in your Organization want to work on Same DraftSight file with proper access control then use SolidWorks Enterprise PDF add-in for DraftSight. 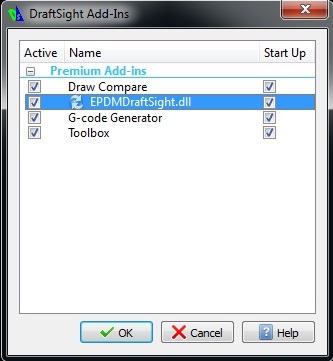 When you Load EPDMDraftSight.dll in DraftSight it shows in DraftSight Add-ins dialog box. How to Activate EPDM Add ins in DraftSight ? If they are not showing then you Can Right click on Toolbars section >go to EPDMDraftSight.dll and Select both Options. EPDM Status box should pop up when you add EPDMDraftSight dll. Initially both checkboxes are Grayed out , as you save your Drawing files and reference files in vault then these check boxes become active. If Check box is selected: This means that Attached Drawing references have latest versions loaded in Drawing file. If check box is not selected: This means attached Drawing references are not up to date and new Versions are available in vault. In this case select this check box to get latest versions of attached Drawing references. If check box is grayed out: This means EDPM add-in is not sure whether attached Reference Drawings are up to date or not. If Check box is selected: This means Drawing is Checked out if cleack check mark then you can check in Drawing. If check box is not selected: This means Drawing is checked in. If select then Drawing will check out. If check box is grayed out: This means Drawing is checked out by another user. If by any reason it is not showing then Go to SolidWorks Enterprise PDM’ Toolbar and Click on EPDM Settings icon. It will Pop up following Dialog box: Select Check box to Show the SolidWorks Enterprise PDM status window. EPDM CHECKOUT: If any Drawing file is already checked in Vault then this options check out active Drawing. In Check out mode you can edit and make Changes in Drawing file. EPDM CHECKIN: This will check in Drawing file and Changes will be saved in Vault. 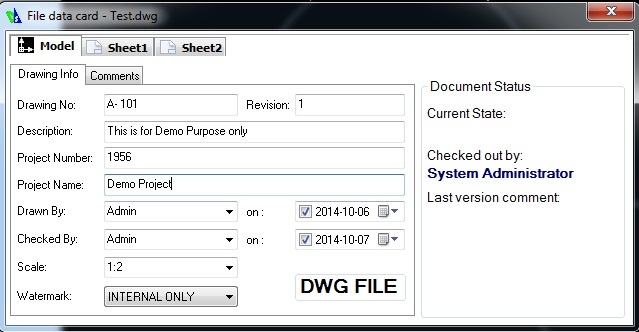 EPDM GETLATEST: This will retrive latest version of Drawing file from the vault. EPDM GETVERSION: This will retrive the selected version of Drawing file. EPDM UPDATECURRENT: This will update Current Title block of Drawing. EPDM UPDATE: This will update all title blocks of Drawing file. EPDM SHOWDATACARD: This options displays Drawing file’s Data Card. You can add or make changes in Following Properties of Data Card. EPDM PROPERTIES: This options displays a pop up message of Drawing file’s Properties which Includes Location, Local version, Latest version, Checked out by, Checked out in , and Workflow state information . Prompt to check out drawings that are opened in DrafTSight and not already checked out. Also you can set Time between checks that all references are up-to-date in Minutes . EPDM CHECKOUTREF: This will check out reference files for editing . EPDM CHECKINREF: This will check in reference files. EPDM EDITREF: This will check out reference file and opens the Drawing file for editing. EPDM GETREFVERSION: This will display selected version of reference file. EPDM GETLATESTREFS: This will display properties of reference file.